NJPW just announced the two blocks for the upcoming G1 Climax tournament, and some dream matches are set to take place, including Okada vs Omega 3. The G1 Climax tournament will take place between July 17th to August 13th. 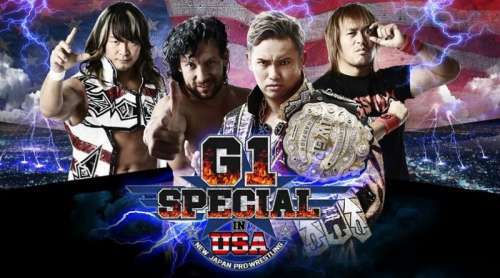 As a prelude to the tournament, NJPW will be holding a “G1 Special” on July 1st and 2nd in Long Beach, California. The weekend special in the USA will see the first ever IWGP United States Champion crowned, along with an IWGP Heavyweight Championship match between Kazuchika Okada and Cody (Rhodes). Day 2’s main event will see the culmination of the US title tournament. G1 Climax is divided into two blocks: Block A & Block B. Each block comprises of 10 competitors, where each competitor faces the 9 other competitors in their respective block. A win is 2 points, a draw is 1 point, whereas a defeat is 0 points. The superstar with most points at the end of all the matches qualifies to the finals to face the winner of the other block. The finals take place between the winners of Block A & B. The winner of the match earns a briefcase which is a guaranteed shot at the IWGP Heavyweight Championship at Wrestle Kingdom, NJPW’s biggest show of the year. What is notable is that the IWGP Heavyweight Champion always participates in the G1 Climax tournament. Since the history of the G1 Climax tournament, only two reigning IWGP Heavyweight Champions have won the Tournament: Keiji Mutoh in 1995 and Kensuke Sasaki in 2000. However, it should be noted that the title shot stipulation of the G1 Climax was only added from 2012 onwards. Based on this, it has been revealed that Okada vs Omega 3 will be taking place sometime during the tournament. There are some extremely interesting match-ups in the card as well for the tournament. Omega vs Suzuki, Tanahashi vs Ibushi, Okada vs Elgin, Tanahashi vs Naito, and Ishii vs Ibushi. From the look of things, Naito could possibly be one of the early favourites to win the tournament. NJPW will begin gearing up for the G1 Climax tournament, with more eyes than ever on their product. While personally not a fan of the fact that Okada vs Omega 3 is happening so shortly after their second encounter, it will surely deliver this time as well. Apart from just that, there are many encounters which will result in epic matches of the highest quality. The G1 Climax 27 is indeed something to look forward to for all wrestling fans!